The world’s leading mobile phone manufacturer, Nokia has presented its new high-tech haptic feedback technology, called Haptikos. Haptikos ables to deliver a “true” tactile/touch feedback to a virtual keyboard on a touchscreen that resembles a real physical keyboard. In addition, this awesome Haptikos system also comes with a slight clacking noise each time you press a virtual button, just like you are clicking a real key. 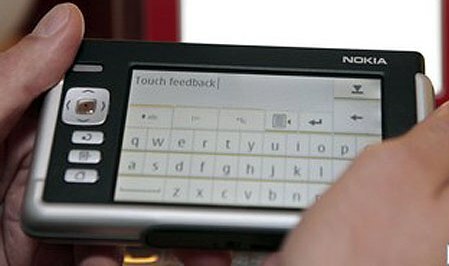 The new Haptikos touch feedback system will apply on the upcoming touchscreen smartphone including Nokia S60 Touch handset to rival Apple’s iPhone and its future iterations. Can’t wait to put your hands on the popular interface layer for Symbian smartphones – Nokia S60 phones? Sorry, you’ve to wait until next year but you can continue to see a demo video of Nokia S60.